consequences of participation in environmental organizations. This book fills the gap by analysing in detail the determinants of environmental participation and its consequences in different parts of the world. Benno Torgler, María A. García-Valinas and Alison Macintyre seek the answer to several questions regarding who is working towards positive outcomes for our environment, what sort of social and institutional context will assist voluntary participation, what sort of attitudes are related to positive environmental behavior, and which countries are active on the intergovernmental stage. By focusing on voluntary participation in environmental organizations, we are able to determine the level of willingness to work towards a solution for environmental problems. This allows an insight into the motivations and attitudes of individuals and nations and how these factors can affect environmental cooperation. Participation in Environmental Organizations sheds light on who is liable to participate and will help to see whose priorities and values are forwarded through voluntary activities and to what extent voluntary participation can become representative. 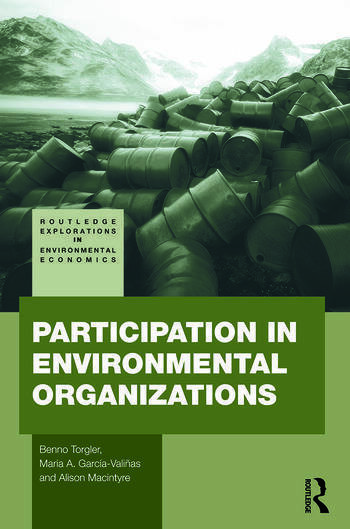 Thus, the book provides a unique examination of citizens’ willingness to participate in environmental organizations. The book will be of interest to Economics students and researchers alike who seek a deeper understanding of the theory and practice of environmental participation. Benno Torgler is Professor at Queensland University of Technology, Australia. Maria A.García-Valiñas is a Junior Researcher at Toulouse School of Economics, LERNA-INRA, France. Alison Macintyre studied at Queensland University of Technology, Australia.